Bassett, M.N. and Sammán, N.C. Adequate intake of folate reduced the risk of abnormalities in early embryonic brain development such as the risk of malformations of the embryonic brain/spinal cord, collectively referred to as neural tube defects (NTDs). Folate is extremely sensitive to destruction by heat, oxidation and UV light. The purpose of this study was to evaluate the use of different extraction procedures and enzymatic treatment to determine folate concentrations in variety of foods using a microbiological assay (MA) with Lactobacillus rhamnosus as the test organism. This study also aimed to evaluate the retention of folate in foods after using different cooking processes. Nine of the most commonly consumed foods in Argentina and that contain folate were analyzed: broccoli, spinach, potato, lentil, soy (raw and boiled); hen whole egg and yolks (raw, boiled and fried); beef liver (raw and cooked); strawberry (raw) and white bread. For this study, rat plasma (RP) and human plasma (HP) conjugases together with acetate and phosphate buffers were tested. In extraction step for all analyses, RP conjugase was selected since it was easily available in our laboratory and small quantities were required. The acetate buffer was chosen since better growth and more reproducible results were obtained in the different conditions assayed. The results allowed the foods to be grouped into a) rich sources of folate: hen eggs, yolks, spinach, soybean (raw) and strawberry (100 and 350μg/100g fresh weight (FW); b) good sources of folate: broccoli (raw), soybean (boiled), lentils (raw) and potato (56 to 83μg/100g FW) and c) moderate sources of folate: broccoli, lentils (boiled), white breads, onions and beef liver (15 to 30μg/100g FW). The folate retention was in the range 14–99% according to both type of food and method of processing. Contents and losses of folate vary widely according to type of food and cooking method. Key words: Folate, folic acid, Microbiological Assay (MA), nutrient retention, Food Composition, LatinFoods. La ingesta adecuada de folatos reduce el riesgo de las anormalidades en el desarrollo temprano del cerebro embrionario, tales como el riego de malformaciones en el cerebro/médula espinal, conocidas en conjunto como defectos del tubo neural (NTDs). Los folatos son extremadamente sensibles al tratamiento con calor, la oxidación y la luz UV. El objetivo de este trabajo fue evaluar el uso de diferentes procedimientos de extracción y de tratamientos enzimáticos para determinar el contenido de folato en distintos alimentos empleando un método microbiológico que utiliza el microorganismo Lactobacillus rhamnosus. En este trabajo se evaluó también la retención de folatos en alimentos sometidos a diferentes procesos de cocción. Se analizaron 9 de los alimentos que contienen folatos y más comúnmente consumidos en Argentina: brócoli, espinaca, papa, lente ja, soja (crudos y cocidos): huevo entero de gallina y yema (crudo, hervido y frito). Bife de hígado vacuno (crudo y cocido); frutillas (crudas) y pan: blanco. Se probó para este estudio conjugasas de plasma de rata (PR) y de plasma humano (PH) conjuntamente con buffers fosfato y acetato. En la extracción para todos los análisis se escogió la conjugasa de PR por ser accesible para nuestro laboratorio y por que se utiliza en pequeñas cantidades. El buffer acetato fue elegido debido a que se obtuvo resultados más reproducibles y un mejor crecimiento en las diferentes condiciones ensayadas. Los resultados permitieron agrupar los alimentos en: a) fuente rica de folatos: huevo y su yema, espinaca, soja (cruda) y frutilla (100 a 350μg/100g peso fresco); b) fuente buena de folatos: brócoli (crudo), soja (hervidas), lentejas (cruda) y papa (cruda y hervida) (56 a 83μg/100g peso fresco) y c) fuente moderada de folatos: brócoli y lentejas (hervidos), bife de hígado, pan blanco y cebollas (15 a 30μg/100g peso fresco). La retención de folato estuvo en el rango de 14–99% de acuerdo al tipo de alimento y el método de procesado. El contenido de folato y sus perdidas fueron muy variables dependiendo del alimento y del método de cocción empleados. Palabras clave: Folato, ácido fólico, ensayo microbiológico, retención de nutrientes, composición de alimentos, LatinFoods. The best sources of folate, considering amount and bioavailability, are liver, fortified breakfast cereals and other grain products, legumes and vegetables (1). The most nutrient-dense sources of folate (μg/kcal) are spinach and other leafy green, romaine lettuce, asparagus, broccoli, orange juice, wheat germ, liver, sunflower seed, cauliflower and cabbage (2). Folate is a generic term referring to the mono- to polyglutamate derivaties of pteroic acid that occur naturally in many foods, and have a closely related biological activity (3).To be absorbed, folate polyglutamates must be broken down (hydrolyzed) to the monoglutamates form in the gastrointestinal tract. Enzymes, folate conjugases, located in the enterocytes accomplish the removal excess of glutamates. Folate acts as a coenzyme substrate in several single carbon transfer reactions to synthesize DNA, RNA, proteins and to metabolize amino acids. Various investigations also linked low levels of folate with increases in plasma homocysteine levels, which is an independent risk factor for occlusive vascular diseases and stroke (4). Research in recent years concerning health-protecting roles of folate versus coronary hearts diseases, certain forms of cancer and impaired cognitive functions have resulted in increased recommendations of folate intake in many countries (5-9). Folate has an important role in the prevention of neural tube defects (NTDs) such as spina bifida, anencephaly and anencephalocele (10). Many aspects of nutrition and the bioavailability of folate are essential to determine the presence of this vitamin in biological materials and in foods. In most nutritional studies, folate consumption is estimated by analyzing food composition databases. Folate losses during cooking and preparation of foods are the result of a combination of thermal degradation and leaching of vitamin into the cooking water (11). Potentially suitable techniques for the measurement of folate in foods include microbiological growth methods (MA), HPLC methods, and competitive-binding radio assay procedures (12). MA is the most widely used method and provides a total folate concentration in food. HPLC methods allow the identification of several chemical species of folate. It is applied to mammal tissues and foodstuff with different folate distribution. Regardless of the method used, MA or HPLC, extraction of folate in the sample matrix and enzymatic deconjugation to transfer polyglutamates to their monoglutamates forms are the key preparative steps. Many problems may occur if conditions for their preparation are not optimized. For example, the folate content in food can be undervalued if extraction is incomplete and also if deconjugation is insufficient (12). There are not standardized analytical methods for folate content determination to generate major food databases information, both MA and HPLC are commonly used but extraction procedures vary among at different studies. The purpose of the present study was to evaluate the use of different extraction procedures and enzymatic treatment to determine folate concentrations in variety of foods. This study also aimed to evaluate the retention of folate in foods after foods usual cooking processes, transformation and storage. Nine of the most commonly consumed foods in Argentina (13) were selected and analyzed: broccoli (Brassica oleracea), spinach (Spinacia oleracea), onion (Allium cepa L), potato, lentils (Lens esculenta), soybeans (Glycine max), hen whole egg and yolks, beef liver (commercial, Pampa humeda origin, European race), strawberry (Fragaria x annanasa; Fragaria Camarosa) and white bread. Crioprotected cultures of Lactobacillus casei subsp. rhamnosus (ATCC 7469, American Type Culture Collection, Manassas, VA USA) were used in the analytical technique to determine folate content. These cultures were prepared in Centro de Referencia de Lactobacilos CERELA-CONICET, Tucumán, Argentina. These microorganisms were grown on Man, Rogosa y Sharpe medium (MRS) and kept in 15% glycerol at -70º C.
Bacto Folic Acid Casei (BFACM) (Difco, Sparks, MD, USA). Both prepared per label instruction. Extraction buffers (0.1M sodium phosphate extraction buffer containing 0.2% ascorbic acid, 0.2% mercaptoethanol pH 6.1. Also, 0.1M sodium acetate extraction buffer containing 1% ascorbic acid pH 4.7-4.8). Folic acid standard (PGA (pteroylglutamic, Sigma P7876) solution 0.1 g/l was prepared with the dilution buffer (potassium phosphate buffer containing 0.1% ascorbic acid pH 6.1-6.3) and was distributed into small tubes and kept at - 20 ºC until analysis). The studied foods were purchased at a local market in Tucumán, Argentina, except for soy grains which were obtained from Santiago del Estero, Argentina. Andean potatoes were obtained from Jujuy, Argentina. Three samples of each food were taken, following previously established sampling protocol (14), for each type of them. They were individually labeled and transported to the laboratory for conservation. Transfer time never exceeded 60 minutes. Vegetables, hen whole eggs and liver were stored individually in plastic bags at 4 ºC. Legumes (lentils and soy seeds), potato and white breads were also stored in plastic bags at room temperature during the night prior to processing. Strawberries were frozen at -18 ºC for two months until analysis. Processed foods were stored at 4 ºC during one day until they were analysed. Triplicates of each food sample were separately analyzed for moisture content. Sample moisture contents were determined within 24 h of purchase. Moisture was estimated in raw and cooked sample. Sample preparation, extraction and analytical determination were carried out under the following work conditions: low lighting and without air flow to avoid the folate oxidation. Fresh strawberries (three samples of ten 200 g trays) were brought from San Isidro de Lules. Variety Camarosa is a firm fruit and with good color and it has a high yield. Frozen strawberries from different trays were randomly taken. The calyces were removed and grinded and sampling by quarter was performed. This process included the following sequence: a pile with strawberries was formed, then divided into four equal parts, two quarters were taken from the extremes and the other parts were thrown away. These samples were mixed and this procedure was repeated until an approximately 500 g sub sample was obtained. Broccoli (Brassica oleracea): 3 kg of each replicate were washed, and damaged leaves and stems were removed. Afterwards, half of the sample of raw broccoli was grinded, mixed and sampling by quarter was performed until a size of approximately 500 g was obtained and was stored until folate analysis. The other half of raw broccoli was boiled in a covered saucepan (100 ± 2 g in 500 ml water, 10 min total cooking time). Finally water was drained and the boiled broccoli was grinded, mixed and sampling by quarter was performed. The raw and boiled broccoli was stored into a clean recipient. Spinach (Spinacia oleracea): three spinach packs of 1 kg each were washed; the damaged or bruised leaves and stems were removed. Whole leaves were taken randomly, grinded and handled in the same way that raw and boiled broccoli. Onion (Allium cepa L): 2 kg of each replicate were peeled, washed, and the damaged parts were removed. The raw sample is divided into three parts. One part of the sample was grinded, homogenized, mixed, and sampling by quarter was performed until a size of approximately 500 g was obtained. Another part of fresh onion was boiled in a covered saucepan (100 ± 2 g in 500 ml water, 10 min total cooking time). The water was drained and the sample was grinded, homogenized, mixed, and sampling by quarter was performed until a size of approximately 500 g was obtained. In addition, the three part of raw onion was baked (100 ± 2 g at 180 ºC for 15 min total cooking time). The sample was grinded, homogenized, mixed, and sampling by quarter was performed until a size of approximately 500 g was obtained. Finally, raw and processed onion samples were stored until folate analysis. Hen egg: each sample, consisting of a dozen eggs was stored at room temperature. Ten hen eggs for the original sample were taken randomly and two groups were formed. The first group was mixed and stored. The second group containing only yolks was separated, homogenized and stored at 4 ºC until analysis. Fresh eggs and yolks were boiled in a covered saucepan (4 eggs/yolks in 250 ml water, 10 min total cooking time). Moreover, raw eggs and yolks were fried (2 eggs/yolks in 5ml of sunflower oil for 10 min total cooking time). Finally, raw and processed egg and yolk samples were stored until folate analysis. Lentils (Lens esculenta) and soybeans (Glycine max): four 500 g packs of lentils sample were bought at the local market; also four 500 g packs of soybeans were used. 250 g of each sample were randomly taken, mixed and placed into a clean recipient. Dried legume seeds were washed and picked over for removal of waste. One volume of legume in 3 volumes of water was soaked at room temperature for 16 h (100 ± 2 g in 300 ml water), afterwards the water was drained, the seeds raw were grinded and stored until folate analysis. Another 100 g of soaked legumes were added to 400 ml of boiling water and were boiled during 25 min total cooking time. Finally, the cooked seeds were grinded in Phillips® processor and stored into a clean recipient until analysis. Stainless steel containers kept covered were used during soaking and cooking of legumes to avoid the loss of folate due to light. Beef Liver (commercial, Pampa humeda origin, European race): four beef livers of 600 g approximately each one sample was grinded, mixed and stored until folate analysis. 100 g of fresh beef liver was roasted in a sheet (100 ± 2 g at 180 ºC for 30 min). Finally, raw and processed samples were stored at 4 ºC into a clean recipient until folate analysis. White breads: 3 kg of white bread (french type) samples were grinded, mixed, and sampling by quarter was performed until a size of approximately 750 g was obtained. Potato (Solarum tuberosum ssp andigenum, variety desiree): 2 kg of each potatoes samples were purchased from Cooperativa Agropecuaria y Artesanal Unión Quebrada y Valles (C.A.U.Que.Va. ), Jujuy and 500 g were randomly taken and stored at room temperature during the night prior to processing. Potatoes were washed, peeled, grinded (100 ± 2 g) and were boiled 10 min in covered saucepans containing 250 ml of tap water. The water was always boiled in the saucepans prior to the addition of any food samples. Thereafter the water was drained; the samples were cooled and stored until analysis (15,16). The moisture content of foods was determined according to 950.46.B (17). Folate retention in the products was presented as percent folate remaining in the product after processing and calculated according to the following equations (18, 19) . One conventional adult male Wistar rat was obtained from Bioterio from Instituto de Química Biológica, Facultad de Bioquímica, Química y Farmacia, UNT. Six ml of arterial blood was collected in 15 ml tubes containing EDTA as anticoagulant and was centrifuged at 5000 rpm 20 min. The plasma supernatant was recovered and stored at –70º C until used. 0.25 mg of dried plasma (Sigma P-9523) was dissolved in 1.25 ml of distilled water and 35 μl of mercaptoethanol was added. The suspension was homogenized at room temperature for 1.5 h. After the centrifugation at 10000 rpm for 1 min, the supernatant was collected and fractioned into small tubes of 1.5 - 2 ml. These solutions were used immediately. Other enzymes used were protease (Sigma, catalogue No. P5380) and a-amylase from Aspergillus oryzae (EC 3.2.1.1, Sigma, catalogue No. A0273). The edible portion grinded from the three replicate collection of each raw and processed food sample was used. Ten g of food sample was weighed in an analytical balance with 0.001 g of accuracy and 20 ml of extraction buffer (1:2 food:buffer) was added. Foods samples were homogenized with an ommi mixer homogenizer (Ivan Sorvall Inc. Norwalk Conn USA) at the highest speed during 2 min. Next, 5 g of all homogenized samples and 15 ml of extraction buffer were placed into a small flask and extracted in a boiling water bath for 12 min. Samples were cooled on ice before centrifugation at 10000 rpm (Centrifuge Allegra TM 21R; Beckman Coulter) for 15 min at 4 ºC. The supernatant was collected and the residue dissolved with 10 ml of extraction buffer and centrifuged at 10000 rpm for 15 min at 4ºC. Supernatants from both centrifugations were pooled and made to volume with extraction buffer. A Flow chart describing the in house sample preparation, including extraction (sodium acetate or phosphate extraction buffer with a final 4.7-4.8 and 6.1 pH respectively), enzyme treatment procedures (using RP or HP conjugase) and folate quantification in different foods is shown in Figure 1. The trienzyme extraction procedure for liver, potato and bread was applied because this method allows a more complete extraction of folate trapped in carbohydrates or protein matrices in food (20). The extraction of folate in starchy foodstuffs varies widely in the deconjugation step. The a amylase digestion is a necessary part of the extraction since its decreases viscosity of cereals extracts, improves easy of handling and, generally, improves reproducibility of the assay. Rat and human plasma conjugase were assayed in order to evaluate the conjugase effect. (1) 6 ml of extraction buffer and 500 μl of rat plasma conjugase were added to 0.6 ml of supernatants. (2) 6 ml of extraction buffer and 0.26 ml of human plasma conjugase were added to 0.6 ml of supernatants. These mixtures (1) and (2) were incubated at 37ºC 2 h and the enzymatic reaction stopped by boiling for 5 min. The samples were cooling on ice and centrifuged at 4500 rpm 10 min (Centrifuge Rolco® Model 2936). Finally supernatants from centrifugation were collected and portioned into 1-1.5 ml and stored at – 70º C until folate assay. The total folate content of deconjugated samples was determined by microbiological assay 960.46 (17) using Lactobacillus casei subsp. rhamnosus (ATCC 7469) as the test microorganism (21, 22). In the microbiological assay, samples suspended in phosphate or acetate buffer were heated to enable extraction of folate. The Lactobacillus rhamnosus was inoculated into a medium containing all the growth factors needed except for folate. The growth of Lactobacillus rhamnosus increased with increasing folate concentrations in the medium and was followed turbidimetrically. Both the growth response with food analysed and standard folic acid in the medium were compared (17). The cutoff points used to classify sources were estimated taking into account the recommendation of daily value (RDV) of 400 mcg of folic acid. Value of folic acid per food > 25% RDV is a rich source of folate. Value of folic acid per food between 15-25% RDV is a good source of folate. Value of folic acid per food between 5-15% RDV is a moderate source of folate. Bibliography values were compared with folic acid content in the food and the method used. The results are presented as mean values from triplicates ± standard deviation (SD) based on fresh weight (FW). SPSS version 15 (SPSS Inc, Chicago) was used to compared optimum enzyme pH and conjugase plasma. Treatment comparisons of means were made with the use of ANOVA one-way test. Differences were considered significant al p<0.05. Results about total folate content of strawberry, determined with RP and HP conjugases, and with two different buffers (phosphate and acetate) are reported in Table 1. *Mean ± SD, RPC rat plasma conjugase; HPC human plasma conjugase; MA microbiological assay. (a,b) Different letters between the rows in each column mean statistically significant differences between strawberries samples (p<0.05). Table 2 summarizes results of the present study and information of bibliography published by different authors. All of the analyses were obtained by MA and HPLC methods. * All folates results are means of triplicate ± Standard deviation (n=3) based on: fresh weight (FW). Moisture determination in triplicates according to AOAC method. MA: microbiological assay; HPLC: high performance liquid chromatography. The results obtained for total folate content was markedly higher in spinach than the bibliography data and values for strawberries were similar to those informed previously (23). Among all foods assayed, the values obtained for eggs yolk contains the majority of folate content, and show a similar behavior to that seen while analyzing whole eggs. The raw, boiled, and baked onions showed a average folate content varied from 12 and 16 μg / 100 g FW, and these were included into values range informed in literature. In different food composition tables and papers consulted, data for folate content of many foods were not available. The total folate content in bread is similar to that reported by Konnings, Roomans and others (24) and it is lower than that presented by Gebhardt (30). Broccoli and roasted beef liver presented the lowest concentrations of folate in this study. 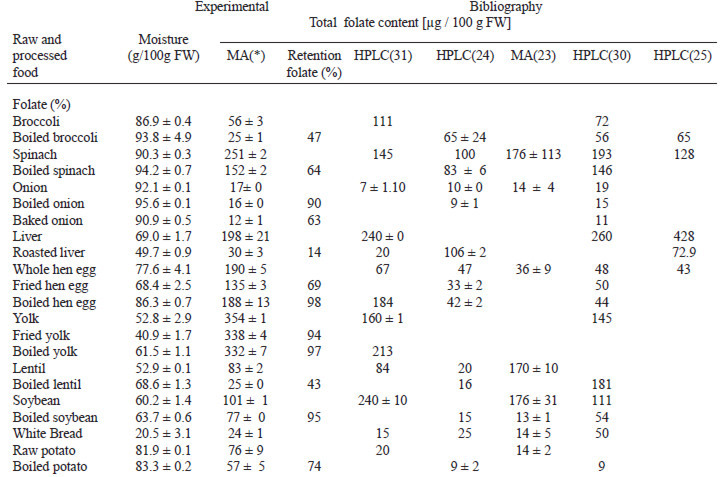 The table 2 shown folate retention in some processed foods. The steaming and boiling of onions, soybeans, eggs and yolks resulted in folate retention of 90, 96, 98 and 97%, respectively. These values are higher than those informed by other authors (23, 25, 26). Folate retention in broccoli and spinach were of 47 and 64% respectively and these results are in good agreement with those of LešKová and others (11) and McKillop (27). The folate retention of 14% in a roasted beef liver was the lowest found. The total folate content was similar with both conjugase and acetate buffer (pH 4). The effect was significant different (p<0.05) only in strawberry deconjugated with human plasma and phosphate buffer. In addition, the total folate value obtained by deconjugation with rat plasma at different pH was higher than human plasma. The deconjugation pH could be an important factor for low folate value in foods deconjugated with human plasma compared to rat plasma. Rat plasma was preferred in this study over other established sources of conjugase (chicken pancreas, hog kidney) since it was easily available in our laboratory and small quantities were required. The acetate buffer was chosen since better growth and more reproducible results were obtained in the different conditions assayed. For the following analysis, RP conjugase and acetate buffer were used. Rat plasma had a higher activity under these conditions, which was also reported previously (28). It is well known that the micronutrient contents highly depend on production conditions of the food (29). The results showed a great variability of folate contents in all foods assayed with regard to the published ones by different authors (Table 2). These may be due to analytical methods, extraction procedure, antioxidant used, conjugase sources, deconjugation procedure and pH of assay. The values obtained with microbiological assay method after RPC in the US and Korea are comparable to the present study results (23,30). Losses in the cooking and soaking waters were considerable and indicated that the leaching was the predominant reason for loss of folates. A very wide range of folate content overall differences in the retentions in the foods studied depend on both the type of food and the processing method that were used. There was a significant difference in folate content of strawberry samples deconjugated with human plasma and phosphate buffer and there was not a significant difference in samples deconjugated with both plasma conjugase and two different buffers. The following foods were found to be rich sources of folate: spinach (raw and boiled); strawberry, and soybean (boiled); eggs and yolk (raw, boiled and fried). Good sources of folate were broccoli (raw), soy (boiled), lentils (raw) and potato. Moderate sources of folate were onions (raw and cooked), lentil and broccoli (boiled); white bread and baked beef liver. There is a great variability in the folate content for all different foods selected in the present assay in comparison with bibliography data. Therefore, it is suggested that an optimization of the extraction and detection of folate in each food group should be carried out. The folate retention in various foods items is dependent on both, the food in question and the processing method. High percentages of folate retention were obtained in boiled foods such as eggs, yolks, onions and soy. Average percentages of folate retention were found in boiled broccoli, lentils and spinach. Also in fried eggs and baked onions. In roasted beef liver, the lowest folate retention (14%) was observed. Cooking affected mainly folate concentration. According to results reported by others authors, there were also great variations in folate retention. It is important to emphasize that these new data will contribute to the ARGENFOODS Food Composition Table/DATABASE (ARGENFOODS) and Food Composition Tables of LATINFOODS. We thank to Florencia Duran and are grateful to PhD Jean Guy Le Blanc. The present study was supported by CIUNT and ANPCyT. Arcot J, Shrestha A. Folate: methods of analysis Trends. Food Science & Technology. 2005;16:253-66. Gordon M, Kessel M, Wardlaw W. The water-soluble vitamins. Perspectives in Nutrition. 5th ed: McGraw-Hill Ryerson Limited 2002. p. 383-9. Gregory JF, 3rd. Chemical and nutritional aspects of folate research: analytical procedures, methods of folate synthesis, stability, and bioavailability of dietary folates. Adv Food Nutr Res. 1989;33:1-101. Anderson L, Dibbie MV, Turkki PR, Mitchell HS, Rynberben HJ. Vitaminas hidrosolubles. Principios de la Nutrición. Nutrición y Dieta de Cooper. 1992:159-62. .
Zhang SM, Hankinson SE, Hunter DJ, Giovannucci EL, Colditz GA, Willett WC. Folate intake and risk of breast cancer characterized by hormone receptor status. Cancer Epidemiol Biomarkers Prev. 2005 Aug;14:2004-8. Bailey LB, Moyers S, Gregory JF. Folatos. In: Bowman BA R, editor. Conocimientos actuales de nutrición. 8 ed ed. Washington DC: ILSI, OPS. Publicación científica y técnica; 2003. p. 235-51. Zhang SM, Moore SC, Lin J, Cook NR, Manson JE, Lee IM, Buring JE. Folate, vitamin B6, multivitamin supplements, and colorectal cancer risk in women. Am J Epidemiol. 2006 Jan 15;163:108-15. Daly LE, Kirke PN, Molloy A, Weir DG, Scott JM. Folate levels and neural tube defects. Implications for prevention. JAMA. 1995 Dec 6;274:1698-702. LešKová E, Kubiková J, kováciková E, Košická M, Porubská J, Holciková K. Vitamin losses: Retention during heat treatment and continual changes expressed by mathematical models. Journal of Food Composition and Analysis 2005:19, pp. 252 - 76. Gregory JF, Engelhard R, Brandary SD, Sartain DB. Adequacy of extraction techniques for Determination of Folates in Foods and Other Biological Materials. Journal of food Composition and Analysis 1990;3: 134-44. Holden J, Perry C, Pehrsson P, Greenfield H, and Burlingame B. Manual de muestreo de alimentos. Versión Preliminar. FAO, Roma. 2008. Holden JM, Davis CS. Estrategias para el muestreo: el aseguramiento de valores representativos. Producción y manejo de datos de composición química de alimentos en nutrición; 1997. p. 115-35. Vinagre J. Diseño de protocolo de muestreo. Producción y manejo de datos de composición química de alimentos en nutrición; 1997. p. 107-14. AOAC. Microbiological Methods 45.2.01. Vitamins and Other Nutrients. In: Cunniff P, editor. Official Methods of Analysis of AOAC International. 16ava ed. Virgin: USA: AOAC International; 1995. p. 41-5. Bognár A, Piekarski J. Guidlines for Recipe Information and Calculation of Nutrient Composition of Prepared Foods (dishes). Food Composition and Analysis. 2000;13:391-410. Murphy EW, Criner PE, Gray BC. 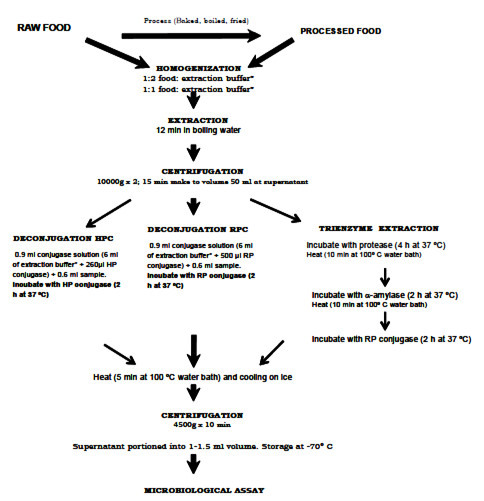 Comparisons of methods for calculating retention of nutrients in cooked foods. J Agric Food Chem. 1975 Nov-Dec;23:1153-7. Hyun TH, Tamura T. Trienzyme extraction in combination with microbiologic assay in food folate analysis: an updated review. Exp Biol Med (Maywood). 2005 Jul;230:444-54. Horne DW, Patterson D. Lactobacillus casei microbiological assay of folic acid derivatives in 96-well microtiter plates. Clin Chem. 1988 Nov;34:2357-9. Sybesma W, Burgess C, Starrenburg M, van Sinderen D, Hugenholtz J. Multivitamin production in Lactococcus lactis using metabolic engineering. Metab Eng. 2004 Apr;6:109-15. Konnings EJM, Roomans HHS, Doran E, Goldbohm RA, Saris WHM, Van der Brandt PA. Folate intake of the Dutch population according to newly established liquid chromatography data for foods. Am J Clin Nutr 2001;73:765-76. Subar AF, Block G, James LD. Folate intake and food sources in the US population. Am J Clin Nutr. 1989 Sep;50:508-16. Ginting E, Arcot J. High-performance liquid chromatographic determination of naturally occurring folates during tempe preparation. J Agric Food Chem. 2004 Dec 29;52:7752-8. McKillop DJ, Pentieva K, Daly D, McPartlin JM, Hughes J, Strain JJ, Scott JM, McNulty H. The effect of different cooking methods on folate retention in various foods that are amongst the major contributors to folate intake in the UK diet. Br J Nutr. 2002 Dec;88:681-8. Vahteristo LT, Ollilainen V, Varo P. Liquid chromatographic determination of folate monoglutamates in fish, meat, egg, and dairy products consumed in Finland. J AOAC Int. 1997 Mar-Apr;80:373-8. Pennington JA. Intakes of minerals from diets and foods: is there a need for concern? J Nutr. 1996 Sep;126:2304S-8S. Souci S, Fachman W, Kraut H. Food Composition and Nutrition Tables (FCNT). 6ª ed. Stuttgart, Alemania: Medpharm Scientific 2000.